Device capture allows you to add video devices sources such as webcams and capture cards connected game consoles or SDI cameras as well as audio devices such as microphones and other audio recording devices. Go to Add source > Devices (webcam, capture cards…) > Video then click on your preferred device. Note that this is different from delay, as delay is used to sync various sources on the stage. Change the current video device to another. Device Configuration Configure different settings specific to your device. Available settings will differ from device to device as illustrated above. 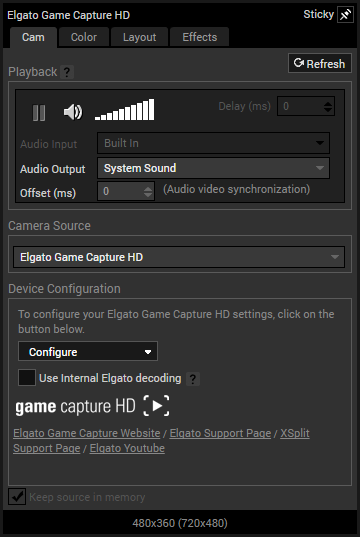 Go to Add Source > Devices (webcam, capture cards…) > Audio then click on your preferred device. 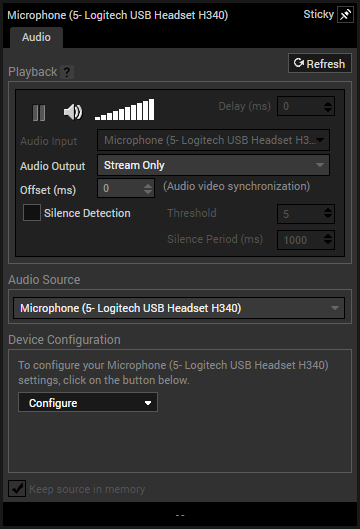 Allows you to choose from System Sound which routes the audio to the default playback device or Stream Only which routes the audio the stream or recording only. Change the current audio device to another. Configure different settings specific to your device. Available settings will differ from device to device. Enable/disable automatic muting of the microphone within the set threshold and silence period.